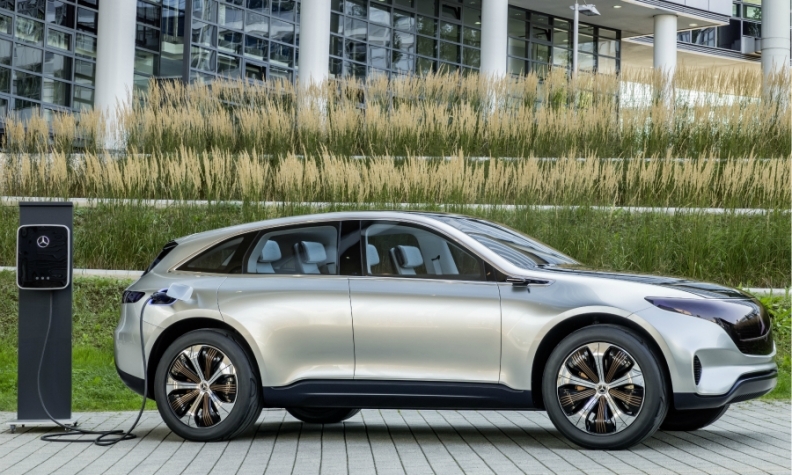 Daimler will launch an electric SUV based on the Generation EQ concept, shown, in 2019. LONDON -- German Chancellor Angela Merkel broke ground at a 500 million-euro ($543 million) plant near Berlin on Monday that will assemble lithium ion energy-storage units for Daimler. Merkel said Germany and its auto industry must invest heavily to ensure it is not left behind by the shift to electric cars. "We need long-term horizons and companies that invest in the future," Merkel said at the site in the eastern German town of Kamenz. "It is important that electric mobility is ready for the market as quickly as possible." The factory marks the arrival of battery-making gigafactories in Europe that will challenge Tesla, which is building at a plant in Nevada, and opens the way for a quicker shift toward green power for both cars and utilities. The facility, 130 kilometers (81 miles) south of the German capital, highlights a push by both major automakers and power companies into energy storage. The technology is crucial to drive the next generation of green vehicles and to hold electricity from wind and solar farms for when it's needed most. With two dominant industries moving in the same direction, the cost of batteries is likely to plunge quickly, according to Bloomberg New Energy Finance. "As battery costs fall and their energy density increases, we could see cheaper battery-electric cars than their fuel-burning equivalents by 2030," said Nikolas Soulopoulos, an analyst with the London-based research arm of Bloomberg LP. Global battery-making capacity is set to more than double by 2021, reaching 278 gigawatt-hours, up from about 103 gigawatt-hours now, according to BNEF. Europe's market share is expected to almost double over that time from 2.5 percent. Large-scale factories planned in Sweden, Hungary and Poland, as well as Daimler's battery assembly plant in Germany, are expected to feed demand from automakers such as Volkswagen Group and Renault. That will cut the cost of lithium ion packs by 43 percent and make electric cars a mainstream reality, the researcher estimates. For the utilities, cheaper batteries reduce the cost of storage units that smooth the variable flows of electric power to the grid from renewables. At Enel, the biggest distributor in Italy, pairing a battery with a wind farm helped grid managers improve forecasts for electricity output from the plant by as much as 30 percent. "Batteries are clearly a key enabler for renewables penetration," said Riccardo Amoroso, the head of innovation at Enel. "We have seen impressive results in our pilot industrial scale projects, especially in terms of increased programming and reduced intermittency." Finland's Fortum Oyj is similarly testing batteries for its gigawatt-sized plan for solar and wind projects, according to Chief Financial Officer Markus Rauramo. Used since the early 1990s in consumer electronics such as computers and phones, lithium ion batteries have made a leap into the transport and power industries. But because of their cost, their application on the grid and in cars is only now starting to spread. The battery boom will be most evident to consumers in electric vehicles, with most major automakers planning plug-in hybrid models by the middle of the next decade. Currently, electronics makers in Asia control the battery business. South Korea's LG and Samsung are among the top vendors, according to BNEF. Asia is expected to maintain its lead with an additional eight factories being constructed in China alone. Automakers are moving quickly to secure battery capacity. Daimler's factory would be the biggest yet in Europe, responding to Tesla's $5 billion Gigafactory venture with Panasonic. At Daimler, batteries will feed both its cars and a venture Mercedes-Benz entered with rooftop-solar installer Vivint Solar to produce home energy storage systems. The factory will be operated by Daimler subsidiary Accumotive. It will supply lithium ion batteries for Mercedes-Benz and Smart EVs, as well as Mercedes energy storage units and the carmaker's 48-volt systems for plug-in hybrids. Daimler has said it expects to bring more than 10 new electric cars to the market by 2022 after unveiling the Generation EQ concept at the 2016 Paris auto show. The SUV will be the first of 10 crossovers, sedans, and compacts that are planned, starting in 2019. The models will be part of a lineup that Mercedes will market under a new EQ subbrand. "Looking a few years out, as we have a stronger penetration of EVs in the market, you'll have more demand on the grid, which may need to be supported by storage," said Boris von Bormann, CEO of Mercedes-Benz Energy Americas. Tesla's plant was about a third complete in January and will give it access to 35 gigawatts a year of capacity when finished, enough for its planned production rate of 500,000 cars a year. This would place the carmaker based in Palo Alto, California, as the No. 2 supplier behind LG Chem. Tesla is also planning to build additional gigafactories. "Later this year, we expect to finalize locations for gigafactories 3, 4 and possibly 5 (gigafactory 2 is the Tesla solar plant in New York)," the company wrote in its fourth quarter letter to shareholders. The scale of Daimler's investment is smaller, and the company hasn't disclosed its capacity goal. Volkswagen is in talks with battery makers over possible ventures and plans a prototype assembly plant in Germany to develop its own expertise. A Stockholm-based startup run by a former Tesla executive, NorthVolt, has also announced plans for a 4 billion-euro battery factory in Sweden by 2023. Higher production of lithium ion units for cars will help slash costs of batteries for all applications, making storage more affordable in homes and on the grid. The result may make electric cars competitive with ones fueled by gasoline or diesel sometime in the next decade. The battery pack is the most expensive part of a plug-in hybrid, making up about a third of the total cost. Lithium ion packs are projected to be 43 percent cheaper by 2021, dropping to $156 a kilowatt-hour from $273 today. To be sure, the wider use of lithium ion batteries is still in its early days and there are potentially competing technologies. It remains an open question whether storage can ever be profitable for consumers or utilities at a big scale. "You still need a crystal ball to operate a system on batteries," said Bridgit Hartland-Johnson, head of energy storage at Siemens Energy Management UK, a maker of wind turbines and power systems. "There are still some unanswered questions." Even so, the battery factories are being built by automakers looking toward an electric future. Plug-in hybrids could make up a fifth of new auto sales, or 21 million units, by 2030, according to BNEF. Merkel's visit to the Daimler plant underscores her government's target to have 6 million electric cars on the road by 2030.